http://www.ynetnews.com/articles/0,7340,L-4589762,00.html – but it also got me thinking about how few jewish DNA success stories there are. Perhaps that is changing now that more people are testing. 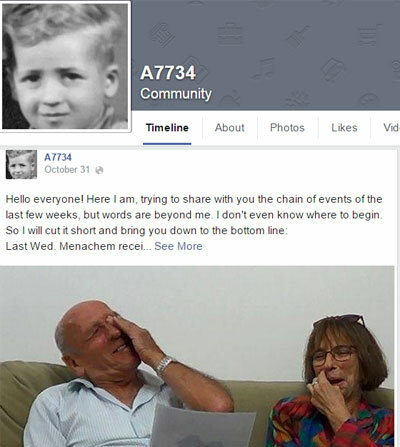 The screenshot at the left is from facebook page A7734 about Menachem’s search. It shows him and the genealogist who helped him, looking at the first picture of his parents he had ever seen. Frankly, success stories with jewish DNA are rare. I have none to report from my family. I emailed all my Ashkenazi researching friends to see if anyone had a good success story. Not very many are out there. If you have one, please send it along. The endogamous nature of jewish DNA is part of the problem. Everyone looks like a close relative in the DNA matching. Another part of the problem is that so few Ashkenazim know their ancestors past their great-grandparents. Too many records were destroyed in WWII, among other problems researching. In my experience, if an Ashkenazi Jewish (AJ) DNA match is not showing as a 2nd cousin or better it is unlikely that you will find the relationship. An experienced Israeli researcher told me to ignore anyone without at least one long segment match of 23 cM. Below are a few tips from search angel Gaye Tannenbaum who frequently works with AJ DNA. 1. Determine if the Second Cousin matches are real second or third cousins. 2. Share match lists (or ICW lists) with your closest AJ matches. You will need to get a list of the close matches to BOTH of you – i.e. 3rd to 5th cousins or closer for BOTH. This will narrow down an ICW list of 1000 to about 20-40 people. By now, you can probably just look at matches that are 2nd-4th or better for BOTH of you. 3. Get familiar with the classic rabbinical lines and German Jewish sources. Those are the only trees that go back further than someone’s great grands. 4. Get familiar with the historical maps and shtetls of Eastern Europe. JewishGen’s Town Finder is wonderful for this. It will give you the name changes, the country changes and show the town on a map along with other towns close by. ABSOLUTE MUST – get the locations for your immigrant ancestors. Born in “Russia” does not count. Get the shtetl name! Look for naturalizations, passenger records, marriage records. Death records are seldom useful – but you never know. 5. Get familiar with history – key expulsions, settlement laws, migration patterns, uprisings and pogroms. The fact that my German Jewish grandfather was an only child and all but one of his uncles’ lines died out may have something to do with my lack of success finding relatives on my Ashkenazi line. We have no 2nd cousins on that line and only one set of thirds. I tested both my maternal aunts and my double 3rd cousin but still no confirmed new relatives. We did find one group that come from the same little town in Bavaria so we know that they are related somewhere. I had a success. And it was huge–my grandfather’s aunt didn’t die in the Holocaust. Full story is at http://larasgenealogy.blogspot.com/2013/06/aunt-shaindel-was-lost-and-found-dna.html. Lara what a wonderful story, thank you so much for sharing it! Also, there are documents out there. On my totally non-Rabbinic maternal side, I’ve traced several branches (documented) back to 4th and 5th great grandparents. It can be done. Thank you so much for posting this blog. My friend and fellow adoptee, Lynn Grubb, saw it, and posted it to my Facebook wall. I am searching for my Jewish birthfather, with almost nothing to go on, other than DNA matches. I read your article, which took me to the A7734 page, where I saw a surname and ran it through my matches (I do this every time I see a Jewish name these days, just in case) and it turns out that this lovely, dedicated genealogist is a 5th-distant match to ME! And, she has several of my 2nd-4th matches “in common with”….whatever that means….I’m just so delighted, excited, at this new direction my search is taking. For over a decade I thought I knew who my father was, because some older maternal cousins thought they knew…but I finally found his sister to test, and it was negative. So…clean slate, fresh start, but what an exciting time for so many of us searching for answers. Thank you for your post!! Those of us who share Ashkenazi and Sephardic Jewish ancestry from Mexico are not mentioned here at all. Our ancestors hid among the Catholic Mexicans for centuries. Granted, our ancestors did not suffer in the Holocaust, but the Spanish Inquisition must have been equally difficult. If you have insights into how Sephardic DNA works by all means share them. I would welcome a guest blog on that topic. This is my personal blog where I hope that others can benefit when I write about what I have learned. Today I summarized what I know so far about Ashkenazi DNA; but I know nothing about Sephardic DNA so have no insights to share. I also welcomed any success stories in using Ashkenazi DNA to find family and was delighted by the story Lara posted. I do have some cousins whose ancestors escaped the Spanish Inquisition thanks to the help of a Catholic cardinal. I am told that the jewish make-your-own-adventure book Cardinal’s Snuffbox by Kenneth Roseman is based on their story – http://www.amazon.com/Cardinals-Snuffbox-Kenneth-Roseman/dp/0807400599 – fascinating but still no help with the DNA. So please don’t feel left out by my lack of Sephardic DNA knowledge! Between FYRs and Genealogy Roadshow, I have ended up working on quite a few cases of suspected Sephardic Jewish ancestry, and even been able to confirm it for several. As a result, Sephardic Jewish DNA has become of very special interest to me. Bennett Greenspan of FTDNA is also very interested in it and we have had a number of conversations about it. It is much more difficult to identify and categorize than Ashkenazi Jewish DNA, but that doesn’t mean that we shouldn’t keep trying to learn more about it. I know that I am committed to do so, Peggy. We need more people of known/confirmed Sephardic Jewish ancestry to test to progress, so encourage testing every chance you get. I follow your pages and shows. Many of my clients here in Texas are descendants of the Monterrey movement (Spanish Sephardim who established Monterrey in northern Mexico in the 1580s). Today they are largely in Texas, Nuevo Leon and Tamaulipas. Let us know if we can be helpful as you seek more folks to test who have known Sephardic ancestry. Thanks for posting this! I too am trying to trace back my Ashkenazi (maternal) roots. While I am just getting started in the DNA side of things, I don’t expect any miracles there based on what we already know with the difficulties in inter-family marriages and lack of DNA sources with which to compare. My question for you, Ms. Kitty, is that in reviewing these birth records from the late 1800’s or so, several sets of parents keep coming up as ‘illegitimate’. I was wondering if that is a common occurrence in your Jewish research or if that is specific to my ancestors. Also, do you have a good reference or guides for naming conventions for Ashkenazi Jews? I understand the background, but I was wondering what (if any) the modern day way of recording these ancient names in our databases should be in order to accurately document our ancestors and help other researchers in terms of discovery. For Galicians, the Austro Hungarian empire did not recognize jewish marriages, only civil ones, the same may have been true in Russia, that’s why the illegitimate. Thanks for the mention, Kitty! If there are any Friedenbach, Weintraub, Itzkowitz, or Lesman cousins out there that survived the Shoah, I’d love to find them. I thought the DNA would help. Now, it’s just a bigger puzzle with a lot of distant cousins. I have tried to sort through my AJ DNA on my own for a while, but have not made any discoveries through DNA. Your post explains why I match a recent AJ immigrant from Russia, even though my direct ancestors left what is now Poland (Galicia and RussPoland) in the early 1890s for New York. I read before that the DNA is highly, as you say, “endogamous,” but you state it so well in your Askenazi DNA post that says we descend from 350 people. Does any other AJ DNA match geographical areas other places Jews landed during one of the many diaspora, like various parts of the middle east and even India? It is my understanding that many AJ people did not take last names until they were forced to do so in the late 1700s. This creates another obstacle to overcome in our research. I look through JewishGen.org periodically, but I’ve yet to have a great deal of luck with online records for my family. Thank you for your insight! I knew almost nothing about my Jewish side of my family, till I met a second cousin of mine. Her grandmother was the sister of my grandmother too. We are even related to you, we just spoke recently in messages. (Hungarian Jewish family). I consider success to find second cousins and to know many things now about my Jewish side, but since that we did not find anyone close… grandmother’s sister made 23andme, and some second cousins appeared, but none of them accepted the invitation yet…and that makes me disappointed. The many 3rd cousins who accepted knew nothing… so you are right, it should be really 2nd cousins to be able to trace back the roots. Hi cousin Peter! Yes we match a few Hungarian ahskenazim so possibly some ancestral sibling moved to Hungary. My two sisters had dna test and are 90% ashkenazi jewish. just yesterday, my sister took a dna test. we are filipino and from we heard, we are somewhat chinese and Japanese. Although, that was not the case. We found out we are the 5th generation of Ashkenazi. we have are 1.4%. Yes, it’s not the biggest percentage, but it took us by surprise. My theory is that, somewhere in my dad side of the family hid the fact they were part Jews. They were living in the Philipiness and being surrounded by Catholics who were told from the Spanish. I believe they didn’t want their children to accidently slip by telling anyone they were jews or they would of been killed and their whole family. I have always wondered why my dad, grandma and the rest of his side of the family had curly hair with light skin. I have heard that my grandpa was great in bussiness and died from doing it. Which seems like he was a hard worker. I have not told my father about the DNA he has in him and his family. He’s a calm guy and it’s hard for me to imagine him being surprised. Hey, I liked this blog. I recently did a dna test and it said 0 percent Jewish. But nearly all of my dna matches have European Jewish. I wondered why do they all have it and I don’t? Any explanation would be helpful. Thanks Emily – where did you do your DNA test? I would recommend uploading your data to GEDmatch and using their admix calculators to look at your possible Jewish DNA. The ancestry composition tools at all the main companies are in their infancy and not yet all that accurate. Hi Emily; probably because you just didn’t happen to inherit the Jewish DNA…. very possible when you get down to cousins. I was an only child so I can’t compare my results with siblings, but if I did, their results might not have shown the same as mine. Surprisingly, my results showed 2% European Jew, mixed with what I did expect; W. European, English, Irish, etc. However, I think the traces of Eastern Europe, Italy and Greece might indicate where my Jewish ancestors had lived in earlier times. I consider 2% more than just a “trace”, but I have oodles of distant cousins from my autosomal test who do show traces of European Jew, and most of them narrow down to one particular line of ancestors of mine. The interesting thing is, so far there have been no indications that these ancestors were anything but Northern Irish, coming to the U.S. around 1730. Go figure! I recently completed FamilyTree DNA and found that a distant (5th cousin remote) who showed up on my matches is from Jewish lines out of Spain and his family fled Spain during the 1700s due to the Muslim conquests there. His side was forced into Moracco, and forced to convert to Islam. However all his other family fled to France, England and Brazil and took on other names, according to the custom of the times, as he said. He has family names. He also said that they remained Jewish and did not convert to his knowledge. With these names, would I be able to track them down to a closer timespan to myself. What is the best DNA test to take on Jewish ancestry, but not too expensive, as I am a graduate student. Since I am adopted, I am literally in the dark on this, as I have no surnames. I became interested in this because years ago, a Jewish friend said they thought I had Jewish in me. I have French, European lines that are about two generations away. Mandy – Have you looked at the methodology at http://DNAadoption.com? They recommend testing at all 3 of the big 3. While family tree DNA, where you tested, is excellent on Jewish DNA, it is also the smallest database. If you can afford only one more test, try 23andme if you are mainly European. How big a percentage is your Jewish side? Have you uploaded your data to GEDmatch? April 25 is DNA day so it is possible there will be sales that day. Thanks! I will give that a try. I used Ancestrydna. Hey Kitty. You may remember me from awhile back. So, I did as you suggested and played with the Gedmatch DNA admixture with my raw DNA. I ran the Jtest and was super stoked to see that nearly all of my chromosomes have some sort of Jewish DNA result from various regions. My highest regions were the Baltics, East Med and Central Europe, most chromosomes had an average of like 20-30 percent on those with some as high as 45 percent. I have middle eastern results ranging from 2 percent to 13.5 percent. My only question to you is am I supposed to add each percentage from each of my chromosomes to get the full percentage? Otherwise, I’m not sure which chromosome to use for my standard percent. For example, for Ashkenazi I received (in order) 6, 6.5, 6.9, 2.9, 2.9, 10.9, and a handful more each under 8 percent. But, if I were to add the numbers from the other sections like central europe, I’d surely top 100 percent which I don’t know is possible. Davidski mentioned that for Askenazi, 25 percent is a good indicator someone is completely Askenazi. I don’t want to go on a wild goose chase for Jewish ancestors too hastily or anything, but should I? Do my results indictate that I have substantially enough amount of DNA to suggest Jewish Heritage? Oh and one last thing, I just noticed that besides the Askenazi Jewish DNA, the other categories match the EUtest. So I wasn’t sure if the balkans, central europe, middle east had anything to do with Jewish Ancestry. Thanks Kitty. You really cleared up the mystery for me. I have around five percent Ashkenazi and by looking at the Oracle population sharing in most tests, I share most DNA with Europeans. A lot of my secondary population include Jewish groups across the middle east/Mediterranean. I’ve concluded that I have possible ancient Jewish Ancestry, possibly even extending to medival times, but most likely no recent history. I was wondering? If I have 13 matches on chromosome 11 from 25, – 36, (region), they are all ashkenazy genetically (4 grandparents are ashkenazy), except for me (from Puerto Rico, may have shepardic or unkown ashkenazy great grand)… And the largest segment is 26.2 (one participant matches from 21,728,961 – 45,008, 403) (total cm for the rest ranges mostly from 10 all the way up to 17.98), and we all triangulate (used gedmatch) and get a distances of 4-5 (escept for 1 which gives a 3-4 distance)… Does this mean that we all share the same ancestor (Which could be either Shepardic or Ashkenazic genetically? Could that be possible; That somehow we all had the same segment of dna from a common ancestor 4-5 generations back? but for some strange reason my family was not aware of it? I forgot to mention that someoene else did the same comparisons for me and he said that the sizes are “good for IDB” or “identical by descent”. This person approached me and got me to notice that I had an ashkenazic shared block with other participants he helped in the past. Once I realized what to look for, I now have other FTDNA cousins who match the same segment, but not being able to triangulate because they are not on Gedmatch. I thought that I could learn more about the origin of their surnames, so I used google and all I could find are stories from holocaust survivor. My mind immediately suggests that if we share a common ancestor its either an acestor who emigrated from Europe to US through Puerto Rico in the 1800’s. What is odd is that I have many other segments that paint ashkenazic, but only in this small section, on this chromosome 11, seem to match all of them (ashkenazic matches). Single segment matches, that is to say a match where there is only one segment larger than 7cM, can be much further back in time than any of these sites predict. That is because shared DNA gets very random once you get past 3rd cousins and even a large segment can continue to be passed intact for generations. Ignore the predictions and look for matches with more than one segment larger than 10 cM and for AJ at least one segment greater then 23 cM (or 18/20 ish). Except for predicted 2nd cousins and closer, the predictions listed are just not accurate for ashkenazim. Thank you for your all of you expertise and taking the time. And also for the presentation you share on gedmatch which helps new users like me tremendously! Welcome to the tribe, I Colon! Your ancestors likely fled the inquisition and made wise choices in order for you to be here today. Celebrate them and learn more about them. Learning history through the eyes of your ancestors is a wonderful and addicting hobby. What does it mean on GedMatch when you show 5.65 percent Ashkenazi? Does that mean it’s something like a great-grandparent? My ancestry.com and FTDNA results show I am basically 1/2 Irish, 1/4 Spanish, and 1/4 Nordic-Fin. Since 6.25% is the expected amount from a g-grandparent, 5.65% could be from a single g-grandparent or 2 gg-grandparents but DNA gets more and more random the further away you get from an ancestor so this could be from further back. Also admixture tools are in their infancy and not a sure thing by any means. Look at the admixture painting to see where these jewish pieces are and check if you match any sephardic or ashkenazi jews there. Hey Kitty, Emily here again. I posted back in December. I found out recently that all those Jewish results were not ashkenazi, which makes sense do to my confusion about not having any euro jewish on ancestry DNA despite having Sephardi and all kinds of other Jewish Pops present in a bunch of my tests and many cousins with jewish trqce regions. That Jewish DNA I believe goes back to my line from Andulusia in Spain, quite long ago. I have about 25 percent spanish DNA. This makes sense to me now. This is what my matches say, their stories confirm this but idk if there are documents from that far back. Also, in conjuction with the sephardi claim, there is also a good amount of Muslim and Hugenot influence in my ancestry. Yeah, thanks. I sort of feel bad cause this blog is intended for ashkenazis to find recent relatives. Looking through the thread it seems like a lot of.people are asking about Sephardi more so than Ashkenazi. I wonder how many people have Sephardi heritage because I only ever heard of the Jews in europe, or what are called ashkenazim. I was very lucky to have a Half first cousin test. I now know pretty certain who my AJ father is. I am probably one In a million. How fortunate to have my father’s niece test. Almost too good to be true. I only found I was AJ by FTNDA testing exactly one year ago. My birth mother gave me wrong info. I’m trying to help a friend who was adopted to find his Jewish father. His DNA say 45% Jewish on Ancestry. We did find his mother. She has not told him who his father was. His mother is African American and father is Jewish, so I can tell who’s on the paternal and maternal side. It seems the matches for Jewish side are not as close. Gedmatch has a 3.6 GEN for his closest Jewish match. Ancestry has closest Jewish match as 3rd cousin. We were considering having him taking the Y-DNA test, but I’ve read up on that and I’m confused as to the best way to track down family. My friend was born in 1967 and he was told the father Jewish, about 50 years old at birth and had two kids. That is all we have to go on. With your knowledge of Jewish DNA, what would you recommend. Is Y-DNA test likely to help or is there something else that may be more helpful. His father isn’t going to be alive, but he’d still like to see a picture of him and maybe learn a little about him. His father 2 children are possibly still living. Mostly interested in finding the father’s name and getting a picture. Test him at familytree DNA and at 23andme as well. More Ashkenazi matches at those places. family tree DNA has massive sales right now and they have Y testing. Yes do a Y test to at least 37 markers but it may or may not help. Surnames are too recent in most Jewish communities for the Y to tell you his surname but it may still help. Just realised I lost password to Baby Clay email address please send reply to new address sent. I would like to know how a person of color whose son has 12% Ashkenazi Jewish DNA go about researching and connecting to find the common ancestor. I am his mother and manage his account. So far no one is responding to share invites. btw took only the 23andMe DNA Test. Thanks in advance. 23andme has the least responsive testers as many did it to discover DNA related helath issues, so I would recommend testing at ancestry.com (use my link in the footer so I get credit) and uploading that test also to ftDNA (which has many jewish testers). I take it this is on his dad’s side? And is a surprise? 12% suggests a jewish great grandparent so look among that generation. If all are known perhaps one is not who he should be. However many Hispanic folk from Mexico and New Mexico have discovered they are descended from “conversos” – Spanish Jews who pretended to convert and then fled to the far ends of the empire so as to escape persecution. They tended to marry among each other until very recently so that is a possibility also. DNAadoption.com has a methodology for finding unknown parents/grandparents that could help you. You asked about successes, and this feels like a success to me. My grandfather had an older sister who died in 1896, leaving three small boys, one an infant. Family members I knew had only the first name of the oldest son and that he had three daughters. A match on 23andMe, who had the known surname of that son and who turned out to be a second cousin twice removed, responded giving me the name of his grandfather, recently deceased. I did a Census search and locate two possibilities–right age and city–for his great-grandfather and the NYC department of records sent me their birth certificates. Comparing that with the holographic will of my great-grandmother, also surprisingly online, I established that his grandfather’s grandfather was my great-aunt’s middle son. Another online search led to an obituary for her granddaughter, revealing her married name and those of her sisters, which I was able to connect to two other DNA matches. So, the DNA match didn’t provide all the answers, but it set me down the right path, opening the history of that branch of the family, hitherto a blank.